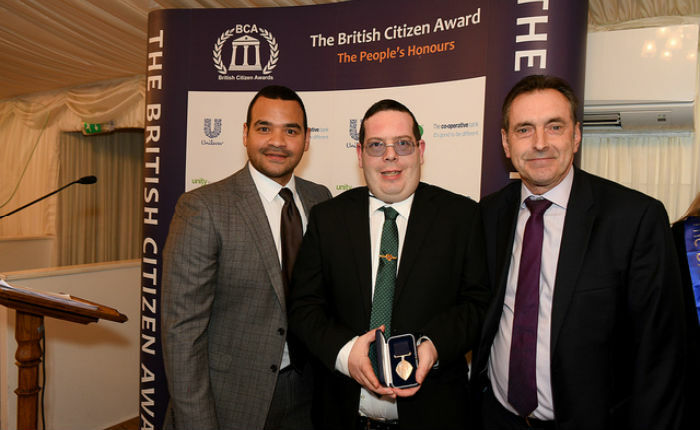 Andrew Willis ‘01 (pictured centre above) received a prestigious British Citizen Award for Services to Volunteering & Charitable Giving, at the Palace of Westminster on 24 January 2019. The Education graduate has been helping the disabled, poor, elderly and unemployed for 12 years as a volunteer advisor. He set up Banburyshire Advice Centre to offer people in poverty the type of help not available elsewhere. Andrew has raised over £60,000 through a mixture of grant applications for the charity and through selling his own art cards made of coloured wax. Andrew is particularly proud that in one year alone the net gain for its clients was over £51,000 achieved through benefit advice. The charity also benefits its clients through supplying essential items such as food vouchers, securing grants and successfully negotiating repayment terms with landlords to prevent homelessness. The Advice Centre works holistically with clients to understand the underlying causes of their concerns. This way Andrew and his team of volunteers are able to genuinely bring a stop to the often-downward spiral of poverty. They also offer educational course advice and career counselling which gives service users the opportunity to change the course of their lives. Often it is the most desperate people that turn to the Advice Centre as a last resort, and yet Andrew feels privileged to volunteer in such a rewarding area where the smile of a relieved client at the end of a consultation is a true success. Andrew said receiving his award was “a great honour and it is nice that my work in the field of education and community has been formally recognised”.